How can I possibly convey the complexity and richness of A Separation without (A) making the story seem oversimplified, (B) reducing my praise of it to “What a great picture from Iran, the Iranians are so good at moving movies,” and (C) revealing so much of the plot that it fails to surprise the viewer? I worry the most about that last point because regardless of what you may have heard about it, A Separation contains a multitude of unexpected elements and surprises. There is no way that overexposure to the film’s plot completely takes away from the incredible experience of seeing it for the first time, but as with any great motion picture, going into it completely “dry” renders the best viewing. So while this review contains minor spoilers, know that the richest experience of viewing this film would be one completely removed from prior knowledge of its unfolding of characters and events. So let’s get some basic information about of the way without delving too deep. Yes, A Separation is a movie about a modern family suffering through the day-to-day tumult of the parents’ impending divorce. Yes, the story is set in present-day Iran, but not among backwards cave-dwelling zealots the media has conditioned us to expect. Yes, one of the parents wants to leave Iran, but not necessarily because the country is an unsafe place to raise children (on the contrary, Iranian society looks remarkably “normal” and well-adjusted to modernity throughout the film, with the only real urban crisis coming in the form of bad traffic.) Yes, the story involves elements of religion and Sharia law. Yes, you could argue that the film is critical of how the spirit of the law can never really reflect the true attitudes and complexities of daily life. And yes, like Roger Ebert, I believe A Separation was the best film of 2011. By far. It is the best film of the last several years, too. Like Crash and Changing Lanes, the film highlights how seemingly chance encounters result in everyday people ultimately revealing their deepest characteristics, fears, flaws, and morals. As in Crash, we see a man caring for his elderly father who is fading to a sad, inevitable decline from consciousness; we see a service worker accused (falsely) of stealing from her more wealthy employer; we see two men lose their tempers and stubbornly resort to outrageous extremes of violence and aggression to justify their prior actions. We see children lose faith in their parents, and parents act childish in the name of protecting the wills of their families. We eventually see a lack of divisions between class, gender, age, socio-economic status, and even religious observation. We are left with the knowledge that we are all made up from the same, morally weak fiber susceptible to falling apart at the hands of the dangerous forces of pride, doubt, and deceit. 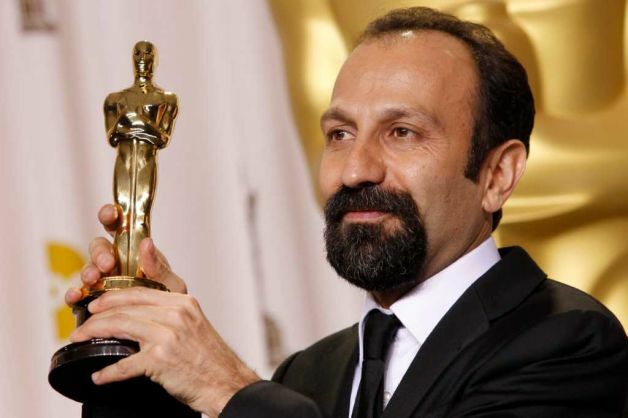 The movie involves six main characters: Nader (Peyman Moadi) and Simin (Leila Hatami), a couple who have separated and are living at different residences; their 11-year-old daughter, Termeh (Sarina Farhadi, daughter of the director, Asghar Farhadi), who dotes on her father and resents her mother for wanting to leave; Nader’s elderly father (Ali-Asghar Shahbazi), who has to be monitored and cared for; Razieh (Sareh Bayat), a caretaker hired by Nader to care for his father; and Razieh’s husband, Hojjat (Shahab Hosseini), a man harassed by creditors. You will not find six more richly-drawn, complex, interesting characters in any movie this year. Never mind what their individual strengths and weaknesses are; they all display signs of loyalty, unselfishness, and humanity. In the remarkable opening scene, at a divorce court mediation between Nader and Simin, Simin observes that Nader is a good husband and father, and Nader says he cannot abandon his father. But around a third of the way into the movie, an event occurs which involves all six of the characters. The rest of this movie will revolve around the reconstruction of this event – what truly happened, which individuals were involved, and who should be blamed and compensated for the toll it takes. 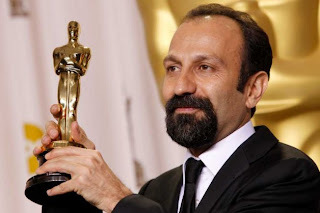 Like a great magician (and somewhat like the best films of Michael Haneke), director Asghar Farhadi creates scenes which, on the surface, seem simple and ordinary, but require a delicate understanding to comprehend the events that follow. And as the characters struggle to communicate and find the answers to these questions, their seemingly pure moralities all simultaneously crumble (with the exception of innocent Termeh, who, along with Hojjat and Razieh’s young daughter, remains mostly a sad observer of the action that unfolds; nonetheless, she emerges as the film’s most interesting and important character). I identify three main lines of conflict throughout the film: Men and Women, Young and Old, and Law and Ethics. Men and Women: Nader and Hojjat are proud, stubborn men who are unable to resolve conflict because of their staunch inability to compromise. Even by the end of the film, when it is apparent that neither man will suffer significant penalties and losses due to their previous actions, they are still unable to reach a mutual agreement. A simplistic observation would be that they display “typical” machismo characteristics of the Persian man. But A Separation is deeper than that, and there are other instances that reveal both men to be quite progressive in their views of traditional masculine and feminine gender roles (Nader says nothing when he sees Razieh’s daughter remove her burqa, and Hojjat is not upset when he finds out that his wife has changed the clothes of Nader’s father). But when Simin meets with Razieh on her own to negotiate a compromise between the two families, Nader is upset that his wife has gone to such lengths of reconciliation without telling him. In this way, there really isn’t anything uniquely Iranian or Muslim about men and women act in this film. They reflect universal truths – men are impatient, irrational, quick to act, and aggressive in their demeanor, and while women try to compromise in a more civilized manner, they are unable to mitigate the irascible manner of their husbands. Interestingly, it is not the male characters who invoke Islamic law in justifying their actions, but the women, and specifically Razieh, who is a devout, pious Muslim woman. Young and Old: The best scene of the film (and there are many to choose from) happens so quickly and so naturally that it may be easy to miss. It involves a central exchange between Nader and Termeh (some major spoilers here). Nader reveals to his young daughter that he had possession of key knowledge that she, the audience, and the Iranian court did not previously believe him to have. In other words, we learn that he has lied to the court about information that would otherwise cement his fate and the fate of his daughter to unhappiness – but all in the name of protecting his family, and maintaining his freedom for his daughter (in this way, law can never truly convey what is “right” and what is “wrong” in a society). Soon, tragically and inevitably, Termeh is asked to stand before the judge and state whether her father’s testimony is correct or not. Knowing that her father’s livelihood lies in the balance in the words that she chooses to say, her reaction is immediate, emerging from her gut and not her brain, and profoundly influential on her ethical development. Once she says it, she can never go back (it’s a little like the climatic “glance” made by a child at the end of Louis Malle’s great Au Revoir les Enfants). Just like everyday life, our moral character is not defined by lengthy speeches or tremendous acts of heroism, but simple “yes” and “no” reactions that contribute deeply to the people we are. We run into these situations every day, and this scene is somehow profound in its sheer banality and ephemerality. As the adults unravel in childish behavior, the children must assume adult responsibility and dignity. Law and Society: As noted earlier, the characters and situations are largely secular, but Sharia law does plays a crucial role in two specific episodes in the film, one toward the beginning and one at the end. Both involve Razieh. Is it entirely fair to characterize A Separation as critical of Islam and Iran? In a way, yes; characters have to circumvent the inconveniences of the law in order to support themselves on a daily basis. In the first scene of the film, Nader and Simin’s grounds for divorce are not considered significant enough for the Iranian court to approve. But the film also illustrates that the law really doesn’t really persuade people from doing harmful things, and nor is it inclusive of what people “should” or “shouldn’t” do. In the central event of the film, it is clear that one of the characters has acted in an immoral way, but what is unclear is whether it is illegal or not. The spirit of Sharia law emphasizes that there is no difference between the practice of the law and the practice of good ethics, but A Separation illustrates that there is a clear disconnect between the two. It isn’t just a matter of characters lying while invoking the name of Allah (although at one point a character does do this). It is a really a question of if law serves any purpose providing citizens with a higher quality of life, which is severely held in doubt by the final two scenes of the film. I haven’t even addressed the look and feel of A Separation, which is one largely made up of handheld cameras, overlapping, commonplace dialogue, and no musical score. In other words, the film is very much modern neo-Realist, and resembles the moral quandaries in the best films of Ozu Yasujiro. The performances are uniformly superb, but particularly Moadi (who is sometimes terrifying in his character’s gradual transformation) and Sarina Farhadi, as endearing as she is quietly complex. It may also be the first film I can remember which audiences will actively not want to leave through its closing credits. The final image of the movie is haunting, symbolic, complex, and unforgettable. When I described A Separation to Todd, I said that it was a little like a mix of Kramer vs. Kramer and In the Bedroom (my two favorite films). Like Kramer, it begins with an unhappy marriage and an impending divorce, with a man and a woman saddled with the knowledge that the hopes and dreams once invested in their happy union have been replaced by bitter arguments and resentment. Like In the Bedroom, we see characters unravel in the aftermath of an unspeakable tragedy, and ultimately, we learn to have little faith in human nature. People are weak, callous, manipulative, and indulgent. 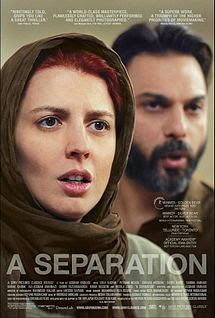 A Separation is not the first movie to say this, and these certainly are not uniquely Iranian problems. But it is one of the few movies which conveys this in a story which is compulsively interesting and complex while at the same time reaffirming the power and joy of watching a great motion picture unfold. It reminds us why we go to movies in the first place. Over the last few years, we as the collective moviegoer have been bombarded with superhero movies. From the great (The Dark Knight, Iron Man) to the not so great (Thor, Green Lantern), it has become a go-to moneymaker for Hollywood. Some of the films have simply been made to build up to one big collective film that would be a "who's who" of superheroes. No matter how great the introductory films were (actually Thor was the only one that disappointed), you knew they were necessary to make this colossal upcoming film a reality. Well, this film it was all building up to was The Avengers, and it finally hit theatres this weekend. So much hype had been built up around this film that you thought there was no way it could live up to it. You also add in the fact that the star-studded films very rarely turn out to be outstanding films. The premise is used so much to sell the film simply to hide the fact that the story is rather lacking. With all this in mind, I was excited yet skeptical of The Avengers. After watching it, there was no reason to be skeptical. It lived up to all the hype. To understand The Avengers you have to understand each of the films that introduces the main characters. Iron Man and Iron Man 2 introduce us to Tony Stark (Robert Downey, Jr.), a genius weapons engineer that really has an anti-hero personality. He is brash, egotistical, selfish, and conceited. It works for him though as he uses his special suit that runs on his heart "battery" for lack of a better term that allows him to fly and fire weapons at his enemies. In The Incredible Hulk we are introduced to Bruce Banner (Edward Norton in the original, Mark Ruffalo in The Avengers), a genius scientist that was exposed to something that causes him to turn into a giant green monster that acts on pure emotion and rage whenever his heart rate gets elevated. He ends up in the jungles of South America as he tries to harness what he views as an "inner demon" and control it as best he can.